Have the time of your life by wearing this fancy and fitted Adult Gold Glitter Disco Shirt. The shirt is extra shiny and would be great to pair with platform shoes and an afro wig. 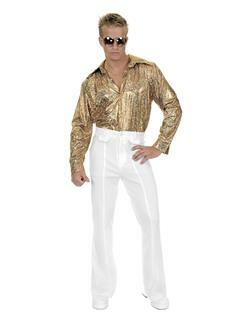 This Halloween will be all about getting on the dance floor and working your moves.